Not all dog food is the same. 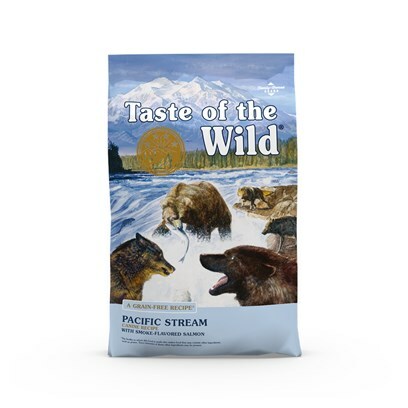 Some products come with fillers like corn and grain that ruin the appetite of dogs, while others are available in the quality and taste that your dog willbecome partial with.Taste of the Wild Pacific Stream belongs to the latter category. Why Choose Wild Pacific Stream? Your favorite canine should get all the energy they need to stay healthy and active.And if you want them to remain active and energetic and healthy then this is the treat for your bud! Treat your dog with this dog food which includes a blend of healthy ocean fish meal, vegetables and berries. The absence of fillers makesthis dog fooda perfect health choice for your pet. Your dog deserves to be pampered. And our dog food can ensure that they receive the nutrition they need to stay fit and healthy. You can buy this product right here, right now. Simply choose the size you need, the delivery option, add it to cart, fill out the required details, checkout, and you’re done! All you need to do is sit back and wait for the shipment to arrive at your doorstep. Salmon, ocean fish meal, sweet potatoes, potatoes, canola oil, salmon meal, smoked salmon, potato fiber, natural flavor, salt, choline chloride, dried chicory root, tomatoes, blueberries, raspberries, yucca schidigera extract, dried Enterococcus faecium fermentation product, dried Lactobacillus acidophilus fermentation product, dried Lactobacillus casei fermentation product, dried Lactobacillus plantarum fermentation product, dried Trichoderma longibrachiatum fermentation extract, vitamin E supplement, iron proteinate, zinc proteinate, copper proteinate, ferrous sulfate, zinc sulfate, copper sulfate, potassium iodide, thiamine mononitrate (vitamin B1), manganese proteinate, manganous oxide, ascorbic acid, vitamin A supplement, biotin, niacin, calcium pantothenate, manganese sulfate, sodium selenite, pyridoxine hydrochloride (vitamin B6), vitamin B12 supplement, riboflavin (vitamin B2), vitamin D supplement, folic acid.